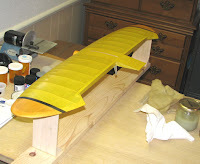 This afternoon I made up an all new mix of satin Klass Kote and shot the bottom of the wing around 1:30 p.m. Later on this afternoon, I decided the wing would be dry enough to spray the top. So around 5:00 p.m. I shot the top of the wing. When I had finished spraying the top, I took the picture below before the atomized Klass Kote epoxy particles had settled out of the air in the closed garage. A little later when I went out and checked on how the wing was drying, I took this picture in an attempt to show you the beautifully smooth satin Klass Kote finish on the top of the wing. I want to share with you a problem I encountered with the satin Klass Kote. Remember last Friday I sprayed the bottom of the stab. Since I let it dry overnight, I sealed the remaining 6 ounce Klass Kote mix in a jar and put it in the refrigerator. Saturday morning I removed the mix from the refrigerator, gave it a couple of hours to come up to room temperature, and then added just a touch of reducer to help thin the mix. I took the time to thoroughly stir up the mix. 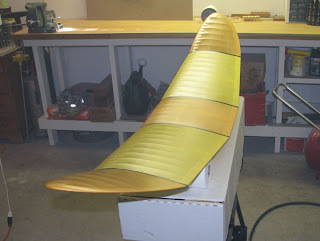 Then I mounted the stab on the second support fixture and sprayed the top of the stab. Here is problem I encountered: As late as yesterday evening the dry coat of satin Klass Kote on top of the stab was not as satin as the rest of the model's components #$@&? (it had kind of a shiny or semi gloss sheen). The only thing I can come up with as to why is that the mix had been placed in the refrigerator overnight and it had a little additional thinner added, which by the way according to Nate Dickerson was supposed to be OK. I kept looking at the top of the stab and debating about what to do for a long time. Since I was never going to accept this miss matched sheen of the top of the stab, I remounted the stab on the second support fixture and resprayed the top of the stab this afternoon in between the time I sprayed the bottom of the wing and the top of the wing. As you can see below, by respraying using the fresh satin Klass Kote I had mixed up for the wing, the satin finish of the top of the stab now matches the rest of the model's components. I will call Nate Dickerson (Mr. Klass Kote) tomorrow and see if he knows what the problem could possibly be.